Mothers News - ZineWiki - the history and culture of zines, independent media and the small press. 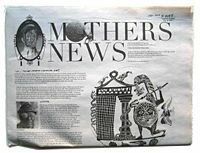 Mothers News was a free monthly newspaper published in Providence, RI, U.S.A., by Rhododendron Festival. First issue of Mothers News was published May 2010. Each Oktober the paper changed the name into Monsters News, starting Oktober 2010. Issues of Mothers News are included in the collection of the St. Patrick's Zine Library. Back issues online Almost every issue is uploaded and can be found on archive.org, but Mothers News is designed to be a physical newspaper, so please bear in mind that they are sort of difficult to read on the computer. This page was last modified on 29 February 2016, at 14:50.